Founder/Writer/Photographer/Entrepreneur. Often the only queer person of color at media events. You can't miss me! Want a different perspective, feel free to reach out and I'll be there. 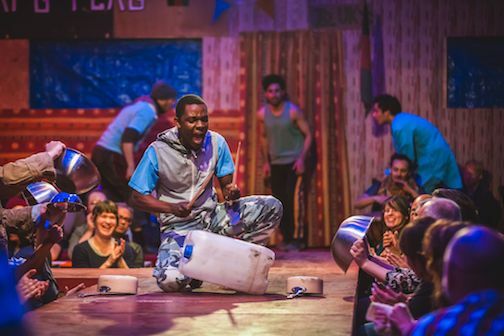 The Curran has brought “The Jungle” to the Bay Area after having sold out shows in New York and London. 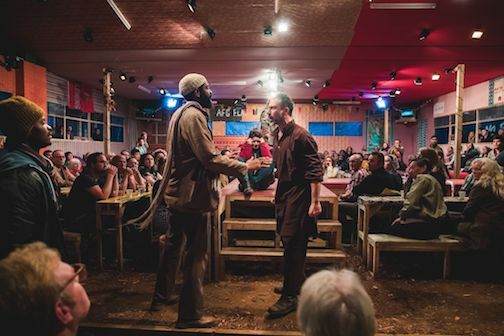 The play is based on a self made refugee camp that was located on the outskirts of the French city, Calais, from January 2015 to October 2016. Calais’s proximity to the UK, the desired final destination, is why many refugees continue to arrive there today. 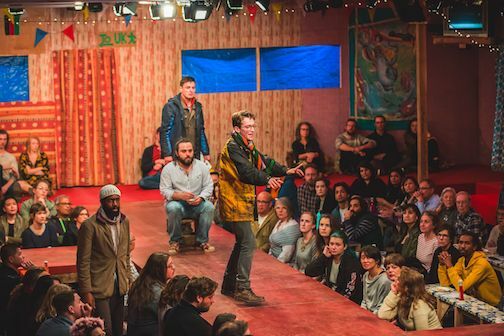 The show was written by British playwrights Joe Murphy and Joe Robertson whom lived at “The Jungle” for seven months, by choice. They created Good Chance theater in the middle of the camp. At the time of their arrival, there were already thousands of people from 25 different countries who had built restaurants, churches, and small living spaces on top of an old landfill. These great feats existing in terrible conditions made them want to get people to tell their stories. 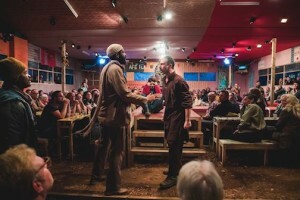 The show is set in an Afghan restaurant located in “The Jungle”. It took over three weeks for the Curran to transform itself into the final intimate space. Seats have been pulled out and the floor has been leveled with dirt. There are wood beams set up, small tables and benches. Due to the limited space to create the atmosphere, the audience is limited to 600 per show. Those with tickets near the stage area, will find themselves in the middle of the action, as actors go up and down aisles during intense meetings, protests, celebrations, and the final destruction of the location. 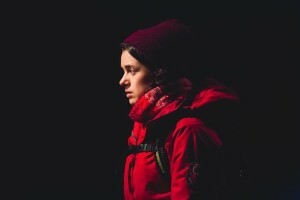 The powerful performances bring to light the humanity behind the faces of many of the refugees, often just seen as pictures in the media, statistics, or charitable cases. It touches on the background of a few personal stories but, mostly revolves around the story behind the arrival and building of “The Jungle”. As everyone is desperately trying to hold on to hope, tensions arise. The countries each person represents also have political conflicts that fuel some incidents, but circumstances force them to acknowledge that they now have more in common. They need to get along to survive, and they do. It’s that unity, drive, hope and creativity that attracts the authorities, ultimately leading them to destroy the camp. Their public reasoning, it was getting too established and would attract more refugees. A falsehood similar to the situation here in the United States at the Mexican border. People do and will continue to arrive despite harsh conditions as they’re often not as bad as the situation the refugees are fleeing from. Also, They. Have. No. Where. Else. To. Go. 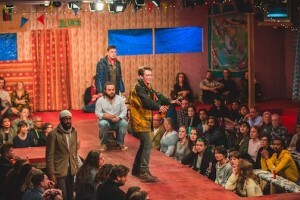 The play also gave voice to some of the uninvited volunteers that started to arrive after “The Jungle” started getting media attention. There is a discussion about wether they should be allowed. Most welcomed the potential help and exposure, while others hesitated. They stayed one night, two nights, and then they didn’t leave. In a poignant moment in the play, these two entities confront each other. Okot (John Pfumojena) a 17-year old refugee, gives a speech to 18-year old volunteer, Beth (Rachel Redford). He takes off his shirt exposing a multitude of scars. She is asked why is she there. She speaks through tears and confusion. He tells her some of the reasons he had to flee his home, his family, and how each tragedy takes a toll on a person, on your identity. How parts of you die with each trauma. This is one of the most revealing parts of the play. Giving someone a few clothing items is not going to bring humanity back to a person. What’s legal is not always moral. Sometimes, the only choice, is to survive. The show is very emotional and honest. Those who consider themselves an “Ally” in these situations, should definitely see this play. A volunteer’s “help” can remind someone that there is good in the world. It can provide a temporary comfort. However, good intentions don’t often lead to progress. Understanding what leads people into these circumstances, not thinking you know a person’s situation better than they do, and speaking up before it happens does, as the countries often being fled too, are often part of the cause that created these unfortunate circumstances. Come Celebrate at this year’s Beer Mitzvah!